Ahmedabad Mirror – Nov 15, 2016 – The world’s biggest dinosaur robots, including a h u m a n – c o n t r o l l e d Tyrannosa-urus Rex, have been unveiled by a Japanese company which plans to build a massive Jurassic style theme park. 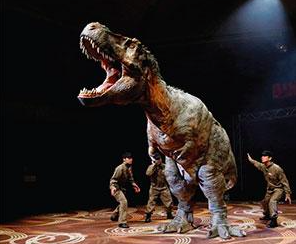 The company unveiled a huge robotic T-Rex at a hotel in Tokyo. The realistic robot emerged from the mist into the event hall, roaring loudly and stomping towards the audience. The creature even pretended to bite the head of a ‘staff caretaker’ as part of the performance. Other dinosaurs, including Allosaurus and Raptors, joined the T-Rex in roaming the hall and letting out growls. “Dino-a- Park”, a cross between new American TV show Westworld and Steven Spielberg’s Jurassic Park, was envisaged by Kazuya Kanemaru, the CEO of ON-ART Corp.
“The fact that we have been creating living things, the desire we have had to want to truly experience dinosaurs, and living things, to draw that out, these are things that spurred us on,” Kanemaru said. “We are striving to create dinosaurs that make people feel as though they are invisible, through how real the dinosaur’s breathing and movements are,” Kanemaru was quoted as saying by the Mirror. The dinosaurs were about eight metres tall and weighed about 38 kilograms. State-ofthe- art carbon fibre materials used for the creatures made them look more rugged and realistic.